This was the first 'proper' bus book I ever got, back in 1982. Written by Barry Arnold and Mike Harris, it told the tale of the late 60s Reshaping Plan and the progressive conversion of routes to OPO through the 70s. I notice from Capital Transport's website that a new edition of the book is coming out in June to mark the 50th anniversary. I don't know whether it is a revised version or a simple reissue, although the pagination seems to have increased. Either way. based on the original version, I thoroughly recommmend it. Thanks for that info. I don't believe I ever purchased this at the time, and it's certainly been out of print for years. I'll definitely be ordering a copy. I like this quote from the Capital Transport site. Fifty years ago this year, London Transport embarked on a large experiment – the London bus reshaping plan. Under it, large capacity one-man operated buses were introduced on suburban bus routes for the first time and many routes were altered and shortened. It was to lead to the worst period in the history of London bus services. This book covers this period with details of the policy, the implementation, the reactions and the consequences. One wonders how future historians will look back on the period from 2000-2020 in terms of changing fortunes, vehicle design experiments and how routes were affected. OK that's much longer than Bus Reshaping covered but it reflects the different Mayoralties and their impact on transport policy. It is good that the book is being republished. I do have a copy of the original but I've never read it in full detail - just dipped in and out of parts of it. ordering large, doored, rear-engined double deckers capable of opo but they had to accept reality eventually, with staff shortages in many areas because of alternative employment at e.g. Heathrow and Fords Dagenham. Conductors had to begin to be phased out, particularly in the suburbs, and some routes urgently needed to be shortened, if only at certain times of the day and days of the week. It wasn't completely LT's fault that the buses chosen for the reshaping weren't up to scratch for London conditions. Flat fare was a radical concept for the day, where introduced, and if fare collection systems had been better delays at stops would have been much reduced. Almost every city operator was going through this, with the bus manufacturing system in meltdown and governments that cared little about public transport generally, and bus transport in particular. There were still some good guys (almost always guys) in LT, Barry Arnold being one of the very best by my recollections, amongst the dross. My contender for the worst period in London bus history would encompass the era from the late 1970s right through the 1980s and into the early part of the 1990s. Margaret Thatcher's obsession with besting Cuddly Ken Livingstone obviously played a big part in this, but London Transport helped play into Thatcher's hand with some of their decisions and actions, as partly detailed in that other Capital Transport book 'Privatising London's Buses'. Cuts in services were many and some areas or individual routes really suffered for far too long, routes 60 and 185 being the best known but by no means unique. Some individuals with dubious motives were allowed to get a toehold in London bus operations, and getting rid of them was not always straightforward. It certainly seemed at the time that London's bus services were in inexorable decline, and it took a series of fortunate events to produce a situation where the bus was given more priority, with increased services and increasing passenger numbers which pertained until relatively recently, although the financial writing was on the wall for it for two or three years prior to that, for those who chose to read it. 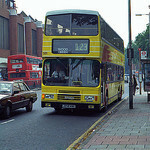 When the book was originally written the Reshaping Plan was clearly the worst phase in London Buses' history. My contender however would be from the mid-eighties as passengers were shunted off high-quality buses mostly built or adapted for Londoners and were forced to travel in converted vans and cast-off buses from around the UK painted in sometimes horrific liveries while hundreds of good quality LBL buses were sold off cheap to operators outside the capital. All the while jobs were lost, salaries were forced down and some much loved garages closed. Things improved but boy did the red London bus feel like it was doomed back in the late 80's. I agree with your assessment. Where I would say the Reshaping Plan differs from the late '80s shambles is that the RP was, on the whole, well-intentioned whereas the other was in part motivated by monetarist dogma and naked greed, not to the extent outside London but that was not for want of trying by certain individuals! Now the book in question has been republished I look forward to reading it for the first time.